Liz Pichon studied graphic design and has worked as an art director in the music industry. Her freelance design work has appeared on a range of products and she has written and illustrated a number of picture books, including My Big Brother Boris. 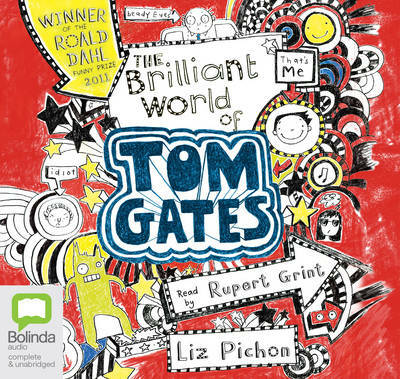 Liz is the author of the bestselling Tom Gates series, which has sold 1,000,000 books in the UK alone and been translated into 36 languages. Liz is married with three children and lives in Brighton. Rupert Grint is an award winning actor, best known for his role as Ron Weasley in the highly acclaimed adaptations of author J.K Rowling's international phenomenon, the Harry Potter series. In addition to the Harry Potter series, Rupert has starred in films Thunderpants, Driving Lessons, Cherry Bomb, Wild Target, Into the White, CBGB and Charlie Countryman. He has also appeared on stage in Jez Butterworth's highly anticipated revival of MOJO in the West End and It's Only A Play on Broadway.